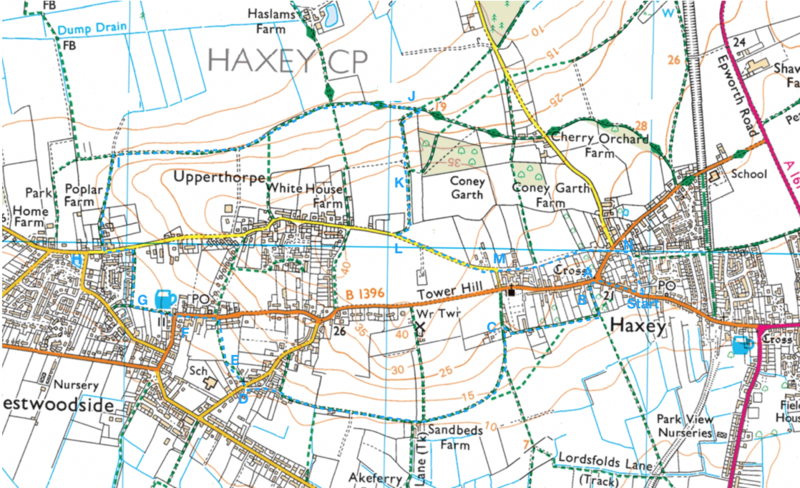 A / B Starting at the Haxey Memorial Hall car park, walk up the road towards the church until you see the triangular green on the right and a narrow footpath on the left, which you take. C At the end of this narrow path between the gardens turn right to walk up the broad track at the top of the fields behind the houses. After about 300m it veers right meeting a narrow metalled track where you turn left. This track descends the slope gradually curving round to the right. D Reaching the houses at the edge of Westwoodside the rough track becomes a narrow tarmac road veering left to meet a slightly wider road with the Westwoodside Methodist Chapel opposite. Turn down the narrow path signposted just to the right of the Chapel. E The path skirts a field border where lamas frequently graze and then curves to the right. On reaching the road turn left. F Walk down the road passing The Carpenters Arms to the footpath immediately ahead. I A further 300m on again turn right. The landscape looks very bare in this autumn photo but there are good views over the flat fields. K/ L The track takes you up the slope towards the water tower eventually reaching a narrow metalled road where to turn left. M Descending the slope you can see the church on your right. At the bend where the road bears sharp right towards the church, you carry straight on to the track in front. N After about 500m the track meets a road which you cross, bearing to the right down the slope return back to the car park. 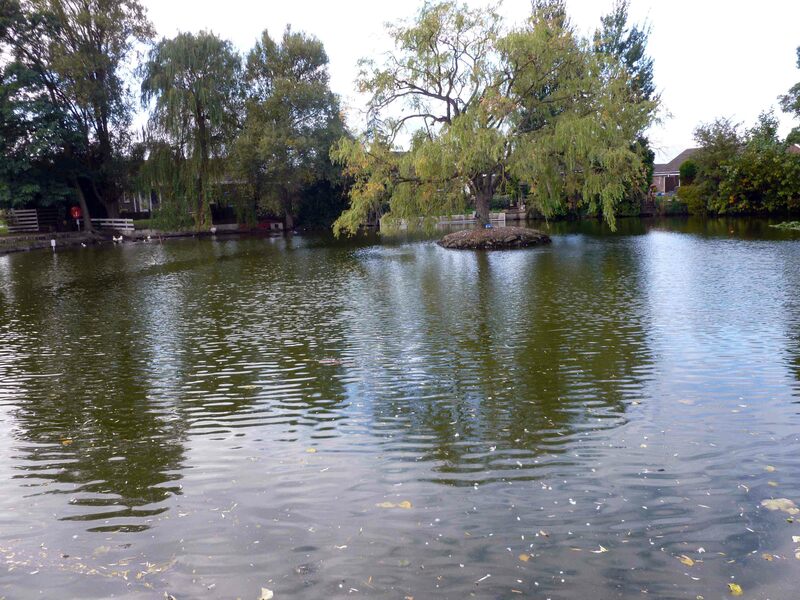 Westwoodside Village Pond as it is today. Shorter walk 2 map To download an easily printed PDF of this map please click here. There are many more old photos of Haxey Parish here. 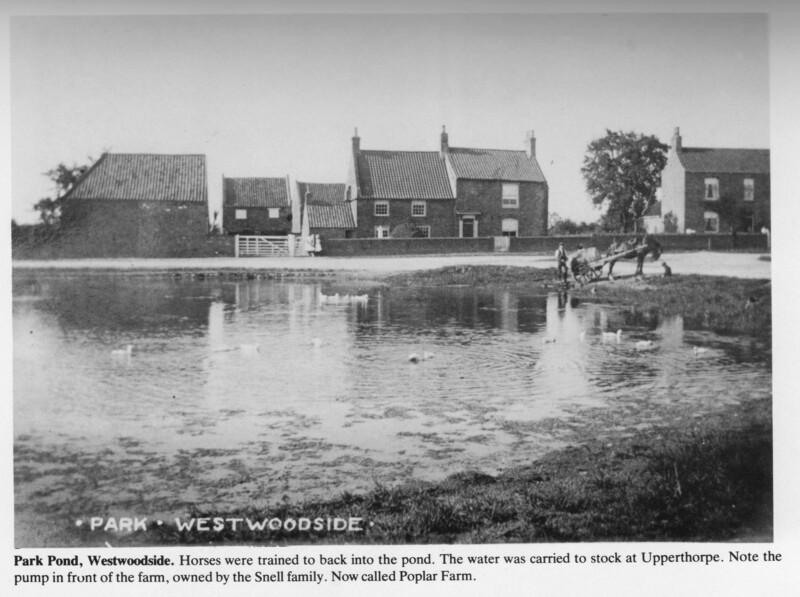 Westwoodside Village pond about 120 years ago.